Where McT disappear to. No wonder he's not with the first team vs Arsenal. Captain the side? and just Scored a goal. By how many goals do we need to win to top the group? 3 goals more the minimum. Derby U23 top with GD of +2 so.. Currently leading 3-0, match is still ongoing. Keep it up. If PSG score one, we score one more goal please. Wow. I mean it's U23, but still.. nice skills in turning, then beating the first defender, and a sweet finish. So he's back playing with the under 23s? As much as I'm not sure he's got what it takes to make it here long term, he is miles ahead of the U23s by now. Got to be looking for a loan to a PL club I'd think. It’s funny how their would be a clamour for a player to step up to the first team if they played well in the u23, but we all know how a lot of people feel about Scott. McTominay is 22 years old in the u23s. It's not the same thing at all. He wasn't really a standout before getting into the first team. He has developed, and he deserves credit for that. For example here you can see the comments mocking McTominay getting a goal, but when Chong scores it's very different. Not taking anything away from Chong because I also think he has bigger potential, but it's not really fair when you think about it. Scott is still a United player and doesn't deserve some of the stuff he gets. Absolutely. When they were genuinely at that level together Matty Willock looked a better player than McTominay. After his initial brief spell with the first team, McTominay looked genuinely a level above the rest at u23 level. He has definitely developed a lot as a player. He does need to add something extra to his game to be anything but a squad filler. I think the key is goals from midfield. He could do with a loan where he plays every week. Still can’t believe Mourinho made up an award for this lad as a personal PR move, what an absolute sociopath that man was. I’m rooting for Scott on this basis alone, that he was used as a bit of a pawn by Mourinho to make a point about both Pogba and his “support” of youth. He’s a hard worker and solid enough and deserves all the best. The main thing he needs to work on is his forward play, always too safe in the first team. So true. It really was pretty unfair on the guy. The fact that Fergie supported him and Ole seems prepared to give him a chance gives me some hope that he could make it for us. The hate this guy get's purely because he was a favourite of Jose is ridiculous. It isn't his fault. While I don't think he will ever be good enough to be a starter for us, he will have a good career in football i'm sure of that. Feck them, just a bunch of morons. I don't rate Scott, but I hope he proves me wrong and becomes a valuable player for this team. In the squad for tomorrow's game. Probably won't start but he's suits the way we want our right centre midfielder to play, in that he is there to just support Matic and be defensively solid, which he's done well in the past. Looking forward to hearing all the caf experts telling us how little Solskjaer, Carrick etc know about football considering that they play him. I don’t rate him at all and I think that he has no future here on the long term, but right now he is the best option we have for the midfield. Pereira is clearly not good enough and there’s something going on with Fred that he isn’t even considered. McTominnay at least has a good work rate and can do the defensive job, that should be enough against Fulham. I would rest Matic or Herrera and play him instead. He’s a mascot and probably has something over someone at the club. He’s managed 2 five year contracts in the last 3 years, and there has been no shred of evidence from his youth career with us up until this day that it’s warranted. Perhaps his name was drawn from a hat. He reminds me of Sam Hutchinson who a Chelsea mascot, and their longest serving player despite never playing for them. Scott has even managed a player of the year award of sorts in his time here! Despite all that, part of me still has to acknowledge that I’m not a pro, so accept that the experts must have seen something that every non-expert has not yet. I'm amazed that people have so quickly forgotten the performances McTominay put in for us against Liverpool and Chelsea last season. I feel like Mourinho's appreciation for the guy has poisoned most fans against him. I don't understand what's the fuss is all about. Seems like many of caf experts here doesn't want the club to develop him. I can see him turning into a good PL level player. At least he can be a physical DM beast if he developed well. Can't we just be happy to see an academy product being trusted by the club? Guess we will see, I don’t rate neither but Pereira has been awful, let’s see how McTominnay does. I agree. That is what happened. I don't particularly fancy him as a current option or even have a lot of faith in him but that is clearly what has happened and it is unfair on the kid. People have nothing to moan about so they turn to this. Even when things were good and well we mostly complained about our own academy products not being good enough when coming through. Fletcher certainly got this, and mainly because he wasn't Scholes. 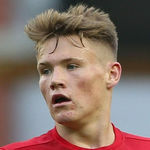 I have no reason to believe McTominay will be a star but no reason to doubt or hate it if he could make it as a Fletcher level player for us, or in the PL. People want that guy from West Ham after a few good games, but have no time for our own I don't get it. He did put in some good performances and at a very young age in a difficult position. For him to maintain that would be sensational, but because he isn't that we shouldn't write him off. Scott has done alright, Perreira has been awful. If I had to let go a midfielder it'd be Perreira first. He's better than Pereira. Definitely can be a good squad player for us. Had a very nice ball in to the box that Smalling just missed and almost scored with a header. Done well. Looked confident as hell when he came on, good cameo that was. Unlucky not to score, brought down a long pass with a great little touch at one point too. Played a more attacking role today, but can also be more defensive and play deeper. Versatile player, who has his uses. Would definitely trust him more than Pereira or Fred. Nice little cameo from McTominay. Looks far more mature than our other rotation options. And he was directly at fault for handing Chelsea a goal. When your best ever performance involves gifting the opposition a goal what does it say about you? It says that young players make mistakes. His overall approach, commitment and basics are good. The fact he was at fault for a goal and yet still had a good game goes to show how well he performed. Besides no-one said Chelsea was his best ever performance. You've added in 'best ever' to fit your point. Well done. Personally for me his best performance for us is Sevilla away. He's more dependable than the likes of Pereira and Fred at the moment. I like him. He takes responsibility and doesn’t shy away from battles.